‘History is full of great tragedies, most of which remain in our minds as ancient misdeeds that couldn’t possibly be replicated in the present day. One of the most terrifying moments of our generation’s history was the rise of the Nazi party and the extermination of millions of Jews and others who did not fit into the Nazi ideal of a ‘perfect’ German ‘paradise’. These atrocities exposed the depths of mankind’s capabilities for evil and although these events happened in the past, the same kind of radical and hateful thinking is apparent today and threatening the lives and safety of many around the world. ‘That which has happened is a warning. It must be continually remembered. It was possible for this to happen, and it remains possible for it to happen again at any minute. Only in knowledge can it be prevented. The danger here is in the unwillingness to know, the urge to forget, and the disbelief that all of this actually happened…’ The words of German philosopher Karl Jaspers are tied strongly to the central theme of ‘Paradise’, which urges us not to forget the truths of history, no matter how horrifying or inconvenient, so that we do not repeat them’. The script of the film was completed in a relatively short time, just a couple of months, even though it required a thorough work of history consultants, specializing in the period of Second World War, French Occupation and the French Resistance movement, Nazi ideology and German military order, as well as the organization and everyday life of concentration camps. Apart from the consultants, the production team of the project worked a lot with the chronicles of the epoch, archive materials as well as the unique photo materials kept in private archives. ‘Paradise is a chamber drama which follows three main characters whose lives are interwoven against the backdrop of the Second World War. Each character demonstrates one’s ability to manifest great strength, yet also succumb to unbearable weakness and fanatical convictions. Olga, a Russian aristocrat and member of the French Resistance, Jules, a fun-loving Frenchmen who becomes a ruthless Nazi sympathiser and Helmut, a well-educated heir to a noble German family who rises through the ranks of the SS developing a set of questionable morals along the way. Motivated by the devastation of war, each character makes a significant life-altering decision based on their own belief of what is right. So what would drive a life-loving French family man to collaborate with the Nazis? What are the convictions of a finely educated heir to a noble German family who finds refuge in a system of inhumane ideals? What motivates a Russian aristocrat leading a carefree life in a time of peace to sacrifice her freedom for someone else’s life? Can a person preserve their humanity, having experienced hell on earth? In the course of the film the characters perform a series of deeds which ultimately shape their destinies’. PARADISE is directed by Andrei Konchalovsky who co-wrote the script with Elena Kiseleva. Julia Vysotskaya, Christian Clauss and Philippe Duquesne star as the principal cast. The elaborate tragic parabola, magnificently shot by Konchalovsky, full of global philosophical ideas and hard-to-answer questions (which is what they expect of Russian art), fits the Venetian program, full of God-seeking and military retro, perfectly well. With its imposing scale, it can easily dominate a number of rivals, and Sam Mendes’s jury is unlikely to leave her without any prize. But we will know it for sure after 10 September. Audacious attempt to combine Holocaust backdrop with metaphysical-tinged romance falls short of its lofty ambitions. It’s a shame that there’s no Venice technical prize, as the great Russian DoP Alexander Simonov would surely have one hand on such a trophy. Simonov shot several features for Russia’s much-missed maverick genius Alexei Balabanov, including the phenomenal Cargo 200 (2007) and Me Too (2012), and collaborated brilliantly with Konchalovsky on the semi-documentary The Postman’s White Nights. Here he works chiaroscuro wonders with what the end credits identify as a combination of 35mm and 16mm stock (projected digitally at Venice), his 4:3 black-and-white images and complex lighting set-ups often harking back to golden-age monochrome cinematography. The look is a neat fit for the 1942-4 period during which most of the narrative unfolds, the boxy ratio serving to emphasize the harsh constrictions of wartime and later, the infernal claustrophobia of the hideously crowded death camps. Paradise is a film not without ideas, most intriguing being the decision to depict events partly from the point of view of a charming fanatic of the Nazi cause, who nevertheless comes to see that the Hitlerian utopia is a corrupt sham. However, the central theme of paradise is harped on so repetitively in the often prolix dialogue that it finally comes to mean very little. 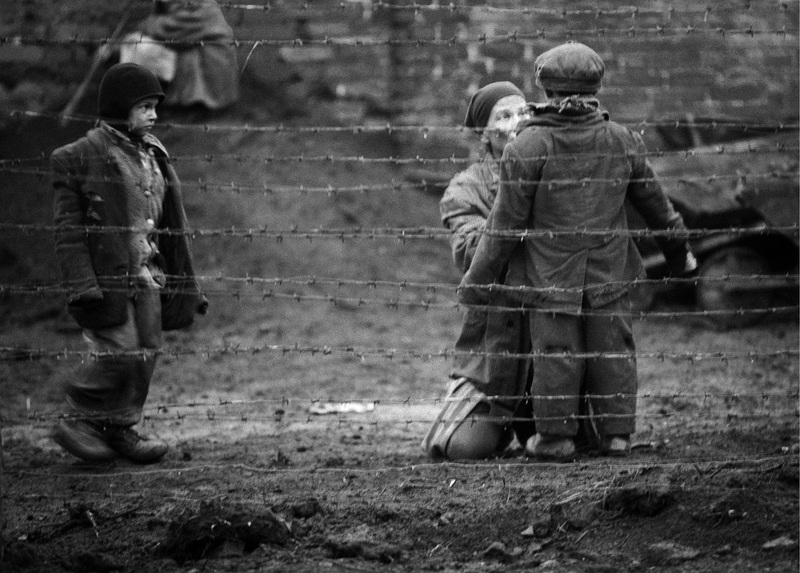 Despite more than conscientious production design, the horror of the camps never feels remotely convincing – Vysotskaya is not the only character to remain looking hale and fresh – and the atmospheric beauty of Alexander Simonov’s photography only adds to the impression that we’re seeing an artefact so elegantly glazed that it finally seems downright improper. Una película en la que el realizador decidió no mostrar las escenas más violentas porque a él tampoco le gusta ver los campos de concentración o las cabezas cortadas. Pero en la que hay una gran “violencia espiritual”, mucho más difícil de contar. Su objetivo era hacer que el espectador “sienta, entienda, ese horror que individuo por sí mismo no siempre”. Y lo logra con una puesta en escena sobria y directa, en la que no hay efectos especiales ni elementos narrativos que distraigan de la historia y del dolor de los protagonistas. Unos personajes coherentes, que aceptan su destino porque no pueden hacer otra cosa y que son los ejemplos de los diferentes comportamientos en la guerra, tres puntos de vista que unidos forman un retrato demoledor del conflicto. 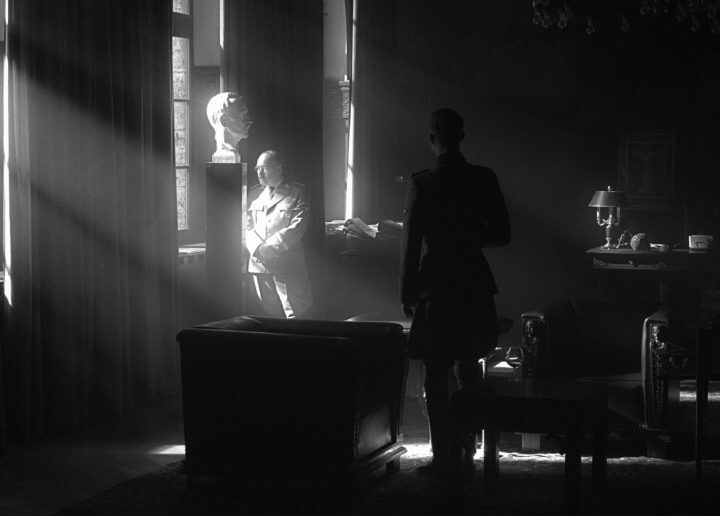 The beautiful black and white cinematography of Alexander Simonov and the meticulous and careful framing of the shots makes Paradise visually sumptuous – perhaps too much so. This arch arty feel is not helped by some of the later more melodramatic turns. The Holocaust as a historical subject is resistant to narrative, with its finding of meaning, its yearning for resolution. Even the name Holocaust can be seen as gracing the mass murder with something like a reason, an explanation and by implication a justification. The religious revelation that concludes Paradise ultimately bankrupts the depiction of the horrors. *Spoiler*: There’s the possibility that the arrival of God is meant to add another layer of irony – after all the pre-Heaven interrogations are not at the Pearly Gates, but in interrogation rooms with the dead wearing something not dissimilar to death camp uniforms – but this seems an unwarranted stretch. Paradise non vuole impartire alcuna lezione, né aggiungere chissà cosa ad una vicenda che è stata oramai più e più volte rivoltata come un calzino. Nemmeno prende le distanze da argomenti tipici, come colpa collettiva, abiezione umana e via discorrendo. No, più semplicemente tenta di umanizzare quei “mostri” dei nazisti, senza invocare cose come ragione di stato, costrizione, paura, oppure infierire ancora una volta su figure francamente negative. La domanda, semmai, è: come si è potuto credere a tutto ciò? “Perché ancora la Shoah? Perché le giovani generazioni non ne sanno nulla”. Il dovere della memoria, imperativo categorico del cinema e dell’uomo: ecco chi è Andrei Konchalovsky, cos’è ‘Paradise’, il nuovo lavoro di finzione del maestro russo, che torna in concorso alla Mostra due anni dopo ‘The Postman’s White Nights’, Leone d’Argento nel 2014. Memoria del passato che serve a leggere il presente e Konchalovsky a chi gli chiede chi sono i nazisti oggi risponde: “Sono i fondamentalisti, tutti coloro che portano all’estremo una filosofia. Prima dei nazisti c’erano i colonizzatori europei e i persecutori dei nativi americani. I nazisti sono venuti dopo, mischiandosi con i nazionalisti. Oggi ci sono i jihadisti -prosegue il regista- Ogni qual volta si uccide l’altro nel nome di una supposta supremazia spunta fuori un nazista”. After “Son of Saul’s” immersive first-person camera gave viewers a visceral new point of view on the horrors of Nazi concentration camps, the bar for innovation in depicting what is already a comprehensively filmed passage of history was further raised. With its self-consciously classical aesthetic — down to the imposition of artificial wear and tear on the image, creating the impression of a long-buried print — “Paradise” looks emphatically back rather than forward, but its perspective is an unusual one, alternating even-handedly between the raddled, subjective accounts of Nazi oppressor and victim, until they meet ambiguously somewhere in the middle. Among other, less earthly implications, the “paradise” of the title refers to the Aryan idyll that the former repeatedly cites as a motivating dream. Yet the longer he talks — in the bare studio environment, without clear location or era, that Konchalovsky has devised for the film’s “interview” sequences — the less clear it becomes whether or not he believes his own rhetoric. Konchalovsky uses the close-ups to create the idea of a confession, while the actors’ speaking in their native tongues, be it Russian, German or French, helps him add authenticity. “My intention was that you could feel the horror that mankind and the individual feels or doesn’t feel because we are always convinced that we are right,” the 79-year-old said. “The bombing in Libya, the bombing in Iraq … all these evil acts were considered to be honorable because they were defending human rights, democracy, freedom,” he said. Mezcla de melodrama y denuncia de los horrores de la civilización bajo una mirada humanista, el filme no llega a traspasar la malla del presente. Paradise dunque difetta nel suo insieme, non ponendo nessun tipo d’interesse – più del dovuto – nello spettatore; ricercare esaustivamente emozioni nel tentativo di farle vivere sulla pelle dello spettatore. Nel suo essere “monito” Konchalovsky ottiene l’effetto mal sperato; non induce a riflettere ma bensì a destabilizzare l’attenzione del pubblico sofferente nel reggere ben due ore di narrazione caratterizzata da un’eccessiva verbosità che trasmette solo indisponenza. Un tragico risultato ma Konchalovsky – forse inconsapevole – riesce ad annullare – clamorosamente – l’efficacia del suo lavoro. Paradise infatti parte con buoni propositi per poi perdersi e non ritrovarsi più. Konchalovsky paints a hell on earth, a hell created by those who dreamed of a paradise… We should recognize: Konchalovsky created a film that was absolutely necessary in modern-day Russia, the country that has no doubts, absolutely sure of its historical righteousness in each and every field. Today, more than in any other time, we need to remind that there was one war for everyone, and even the notorious scoundrels who invented gas chambers are human beings that have right to justify themselves before the God Almighty. It is not exactly the latest thought available, but it is a necessary thought in the time of historical snobbery. The film is made in the documentary style: at least a half of what the spectator sees on the screen are literally speaking heads. However, though the characters are real, they are played by actors. As for the action, it takes place during the Second World War in Nazi-occupied France. Both those facts paradoxically draw The Paradise closer to the last-year Venetian hit, Alexander Sokurov’s Francofonia. The author closest to Konchalovsky’s heart is Chekhov, the director having staged all his plays in theatre, and The Paradise is also a kind of theatre play… Austere black-and-white image with a little emotional tint of nostalgic music by Brahms completes the topic of paradise on earth, showing it is a utopia not only unrealizable but mortally dangerous. A controversial if not provocative solution offered by Konchalovsky to the paramount topic of contemporary cinema brings Konchalovsky right away in the ranks of possible competitors for prizes. All the more so because he had not made such a far-reaching film (more in the sense of author’s message than in the sense of the intimate space of the film) for many years. 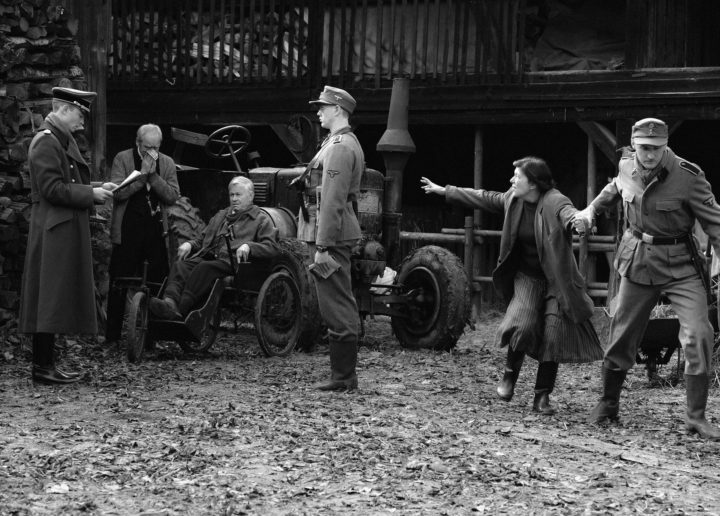 The film, formalist, precisely measured, cold, black and white in many senses of the expression concentrates the attention of the spectator not on the Holocaust victims (there is no emotional speculation here) but on the personal choice of the man who finds himself a contemporary and a witness to the tragedy. Is the neutral approach possible? Are there justifications for a rational complicity in the crime? The main value of The Paradise is not its artistic merit (though it is impossible not to mention the cameraman Aleksandr Simonov who had shot best Balabanov’s films and the previous Konchalovsky’s film) but this question, very topical nowadays and evidently important for the author himself. It was this aspect that impressed the European public that welcomed the film enthusiastically. The simplest thing I can say: the topic of the film is close to the fundamental idea of my film Inner Circle, it is about the temptation of the evil. The Evil should look similar to the Good, it should be seductive. If it were not seductive, people would not rush with such zeal in this abyss, in the turbid river of the Evil. But to be seductive, the Evil should not look like evil. And here we are confronted to the very essence of the paradigm of our life. Tolstoy once said, looking at a beautiful woman: “It is a great delusion to identify the Beauty with the Good!” So it is a serious question for a contemporary film director – how to show the seductive Evil? I am interested by the gray zone where there is no sharp boundary between the Good and the Evil. Every personality is a battlefield of God and Devil. “The humanity” would not hear but he that hath ears to hear, let him hear. It is not necessary for everyone to hear. In general, any attempt to answer eternal questions is doomed to fail but it does not mean we should not try. The artist meets with failure every time but the scale of his failure reflects very often the scale of the artist himself. Konchalovsky manages to inscribe his risky experiment in the context of contemporary cinema, though to reach it, he has to roughen the artistic facts. The director and the cameraman Aleksandre Simonov use black and white image but unlike Ozon in his Frantz they use it not as a stylization method calculated to bring closer the realities of old times, but, on the contrary, a method of estrangement, turning the ambience of the film in a grotesque suspense. It is a pendant, even by name, to another historical grotesque film, Brimstone by Martin Koolhoven, where the heroine is born, lives a life full of trials and tribulations and perishes in the hell on earth. The Paradise has something in common with all the main motives of the Venetian contest, not just topically but also formally. It is a mixture of intellectual metaphors and low genre bordering on cruel melodrama, of psychological thriller and kitsch which is evidently the only way to address such material. In last seven decades it had been the target of art and culture more than once. Theodor Adorno had once declared that poetry is impossible after Auschwitz. Mikhail Romm with his co-authors Maya Turovskaya and Yuri Khanyutin put forward the theory of “ordinary fascism”. Luchino Visconti did not agree and conferred an infernal mythological tone upon the topic. Hannah Arendt started to use the term “banality of evil”. To combine these points of view, you need the contemporary literature with its rich experience of postmodernism (The Kindly Ones by Jonathan Littell) or a genre film able to melt all the theories of what is impossible to explain, in the crucible of a campfire story that melts both the documentary hyperrealism and the subjectivity of a confession. The Paradise puts together cinematographic clichés of different eras including the time when Konchalovsky still had something to say to the world (the Seventies). He often refers to himself, including Maria’s Lovers, the best film in his long career. However, Andron Sergeyevich, who loves to accentuate in newspaper columns his ethical and aesthetical dandyism, should know better than anyone else that the art is largely a matter of taste, and it the taste of The Paradise that poses most problems. Scenes of prewar life here remind the adventures of the scarf in Sunstroke, the final scene where God invites to come to see Him is worse than all the Malick’s dinosaurs. It is, however, not excluded that The Paradise will get the Best Director prize. The view of the life of the characters does not belong to anyone of them; nor does it belong to the History itself, for that matter. It is probably the view of the Creator and that is why there is nothing in this view but the beauty, the beauty without sadness, without drama, without superfluous excessive characteristics. Aleksandr Simonov’s optics is assimilated to the divine optics, it is the heart of the film. The brilliant cameraman who had worked with Alexei Balabanov and is, for the second time after The Postman’s White Nights, working together with Andrei Konchalovsky, becomes really great in this film. Close shots of short-haired Olga’s ‘screen tests’ remind the portraits of the cameraman Rudolph Maté from Carl Theodor Dreyer’s The Passion of Joan of Arc, but without ecstatic angles.